The ParaZip is the ParaBeam younger Brother with many common features. The main difference with the ParaZip is that the ParaZip's lamps are stacked in a linear fashion. This gives the ParaZip a longer, more shallow profile which is ideal for low ceiling applications. The ParaZip is a directional softlight ideally suited for today’s rigorous demands for high quality color-correct, cool lighting for HD television. With the introduction of HD broadcasts, it has become highly evident that the quality of light is more critical than ever. Every imperfection and detail of camera talent is now up for scrutiny. Traditional hard light can exaggerate those textural details. Soft light can subdue those same textures and render a more cosmetic appearance. The ParaZips afford lighting designers the necessary light control required for a studio environment. The lamps are dimmable from 100% to 5% as well as switchable (turning on/off two lamps at a time) from a lighting board through DMX. The ParaZip fixtures run on universal voltage from 100-240VAC and can be used anywhere in the world. The instrument can be tilted and panned as well as rotated to take full advantage of the lateral beam. Varying degrees of louvers (90°, 60°, 45°) reduce the need for barndoors and help create a soft edge. The sleek profile is well suited for a low ceiling studio environment. The parabolic louver design eliminates the necessity of adding intensifiers. In small studios a narrow design also allows other fixtures to operate within close proximity. The fixture is not encumbered with long barndoors or intensifiers. The selection of the appropriate louver 90°, 60° or 45° Louver is more efficient than barndoors. Intensifiers are only necessary in fixture designs that have inefficient reflectors and where lamps are too closely spaced. From a “green perspective” the ParaZips provide great energy savings. Both have the same light output. The air conditioning load to handle heat generated by lighting is calculated in Btu/kWhr. Factoring this type of power and energy differential in a studio adds up to monumental savings in green house gases, not to mention money saved. Lamp life of a compact fluorescent for the television and motion picture industry is determined more by its lumen maintenance than by its actual burn time. All fluorescent lamps display a lumen depreciation curve. This means that over time the light output gradually drops and lowers in color temperature. A lamp may be rated at 10,000 to 20,000 hours but its useful light quality is shorter. It is realistically more in the 2000 to 2500 hour range. In a Studio environment this adds up to about 1 year of continous use. All fluorescent lamps require some "burn in" time before they operate at their rated Kelvin temperature and brightness. For dimming products, the lamps perform best after 100 hours of operation. True Match lamps are formulated to correspond to the spectral distribution curves of film and television cameras as well as look correct to the eye. They are designed to match the colors from studio quartz units or daylight sources such as HMI’s. This gives the lighting director the option of mixing quartz hard light sources with fluorescent soft sources. Most lighting designers want the ability to use both qualities of light to enhance the set. Architectural lamps are designed to optimize government-mandated standards for lumens per Watt efficiencies (energy savings targets). In order to achieve these standards the lamps contain high levels of green spectrum, which our eyes don’t perceive as inaccurate. Film and television cameras do record this added green. For example, green renders a Caucasian skin tone as grayish and unattractive. The architectural lamps do not match with other studio lamps. They render colors inaccurately and make correction in post almost impossible. In 1995 Kino Flo received a technical achievement award from the Academy of Motion Picture Arts and Sciences for the development of the first color-correct lamps for film. Kino Flo continues to be a leader in the industry introducing new developments and constantly improving the efficiencies and formulations of its lamp technology. 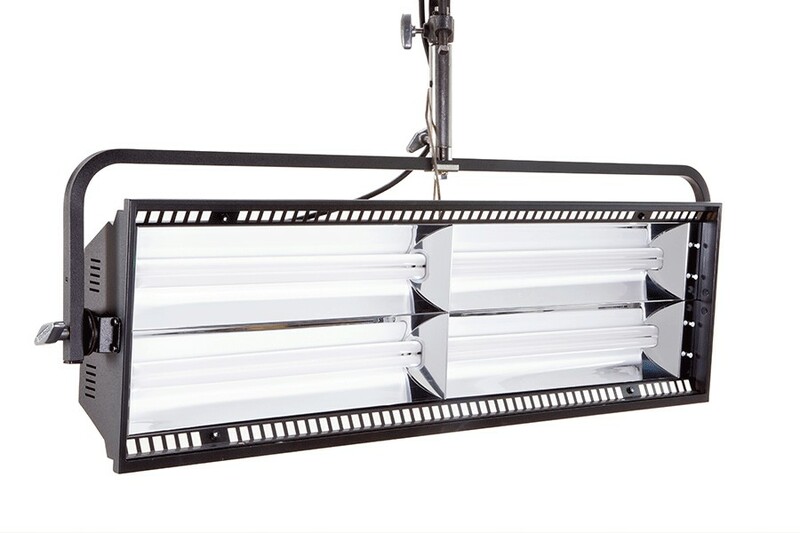 For Kino Flo heat management is a critical design element of fixture design. The physical heat of the lamp directly influences color temperature and lumen performance and lamp life. or a vertical orientation where the base of the lamp is above the lamp tip. Two special cooling chambers at opposite ends of the fixture provide ventilation. This ensures that the heat from the lamp is drawn out of the fixture and away from the body of the lamp. A temperature-stabilized lamp will provide consistent color performance. The deep parabolic reflector further prevents the heat from lower lamps to be transmitted to the lamps above. A well maintained lamp temperature extends the lumen maintenance, color temperature and life of a lamp. of light and efficiency. The ParaBeam puts the light where it is needed most. Barndoors or flags can still be used to eliminate spill above and below the rectangular area without reducing the efficiency of the instrument. Another great advantage of the ParaBeam over conventional quartz softlight units is the efficiency of the reflector design. Quartz soft lights rely on a white painted reflector that yellows and gathers dust. This alters the color temperature and reduces light output. The drop off is much like a bounce card. For this reason soft lights have to work close to their subject matter. The ParaBeam reflector is a precision design using highly reflective material that is shaped to project a beam of soft light at a focal distance of about 16 feet. This explains how 220 Watts of good design can equal 2000 Watts of inefficient design. Reflector designs by other manufacturers of fluorescents tend to be shallow and inefficient. In order to get more light output, they add expensive and time consuming accessories called intensifiers. These are large reflector panels that attach to the four sides of the fixture. They make the fixture twice as big and add unnecessary cost. The ParaBeam's lumens per Watt out performs all other units in the market. Photometric performance is very important. It is also important to note that other manufacturers use high green-spiked lamps to artificially boost their photometric values. The traditional Yoke Mount was designed to allow the yoke brackets to be placed in one of two positions. The additional option is useful when hanging the units in a studio with a low ceiling. The Yoke Mount can be mounted to a baby pin using (MTP-I40) Baby Receiver Assembly (16mm) or to a junior receiver using (MTP-I80) Junior Pin Assembly (28mm) (both sold separately). The Pole-Op Yoke includes an attached junior pin and offers an advantage of lighting from a grid and eliminating the need for ladder access or costly automated rigging and hoist systems. The ParaZips can be controlled through a DMX 512 digital protocol and have an Auto Terminate feature. They do not require dimmer racks. This saves capital costs as well as energy costs. Most studios are designed with dimmer racks that are regulated from a lighting board. The lighting board sends out a DMX signal to the rack that adjusts the voltage to the lamps through pulse width modulation. The more quartz lights are used, more dimmer racks need to be added. These racks generate heat and noise and require a special soundproof room. Studios using Kino Flos can rely on a simple DMX lighting board to control the fixtures. The dimming electronics are contained in the fixture and do not require expensive dimmer racks to adjust line voltage. The DMX signal regulates the dimming levels. There is no additional noise or heat generated by this process. Small studios can use dimmer control boards that cost as little as 0. With the push for reducing fossil fuel consumption, TV studios are looking at cooler more efficient lighting systems to reduce costs and save energy. Part of this process involves generating energy values to determine savings. One of the most important values is Btu/kWh. Any light generates a percentage of usable light and the rest in heat. For example, a standard incandescent light bulb converts only 11 percent of its electrical input into visible light, while the rest is dissipated directly as heat. There are energy costs involved in cooling the studio environment. The measure of Btu/kWh is a means of calculating the thermal loads related to operating lighting.